Tech Thursday: Post Secondary Champs? What every US citizen said they always wanted… NOT! 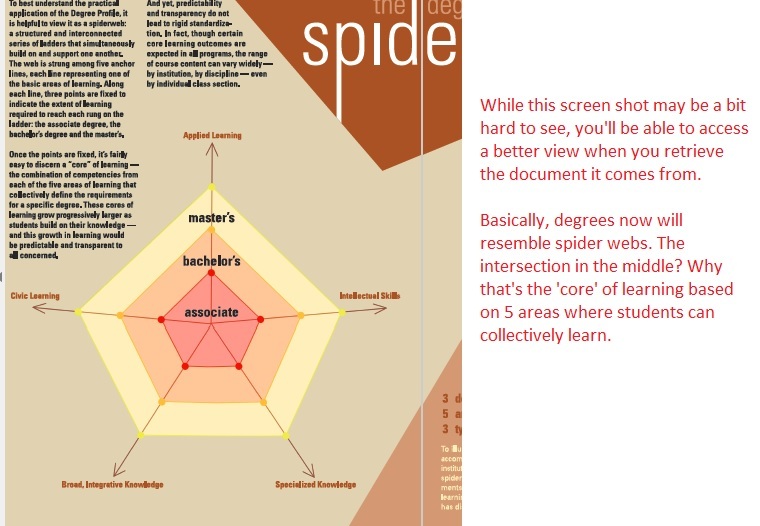 For today’s “Tech Thursday” article, I want to shine the light on the CCSS alignment in post-secondary education yet again. Shouldn’t my focus be on the re-authorization of the ESEA (Elementary and Secondary Education Act)? While the focus is on that (my last 2 published articles were devoted to the ESEA re-authorization push), we need to understand the upcoming push to re-authorize the HEA (Higher Education Act) is ALSO in need of our attention. Why? The CCSSI (Common Core State Standards Initiative) depends on a TOTAL alignment, from pre-K to grad school, to be complete! In my researching the subject, I know the CCSS Machine (all the efforts put into motion by the CCSSI) cannot succeed with only a pre-K to 12th grade movement. It HAS to encompass ALL education for it to succeed. It is my goal, since I began researching and speaking out, to foil those actions as much as possible! So, what can I shine the light today? Read on, my fellow Warriors…. The CCSS Machine has churned out many names to confuse and detract the general public from the fact that no matter what name it stuck on their modern education reforms, it’s STILL Common Core aligned! Case in point, ‘career readiness’, ‘college and career readiness’, “CTE, Career Tech Education”, “Career Pathways”, and so on. While the War Against the Core is raging on in the K-12 arena, movements in the post-secondary realm are continuing on. It is my belief that is exactly what the CCSS Machine wants. For us to be so attentive to only one portion of the reform, we don’t notice the reform efforts in birth to 5 years, or the post-secondary areas. Did you know that more and more states are establishing now (or have established in the past) CRIs (Career Readiness Initiatives)?? http://www.cde.ca.gov/eo/in/cr/ However, since I don’t live in CA, but NC, I’m going to use NC as my example for the most part to see what moves the CCSS Machine has made here. 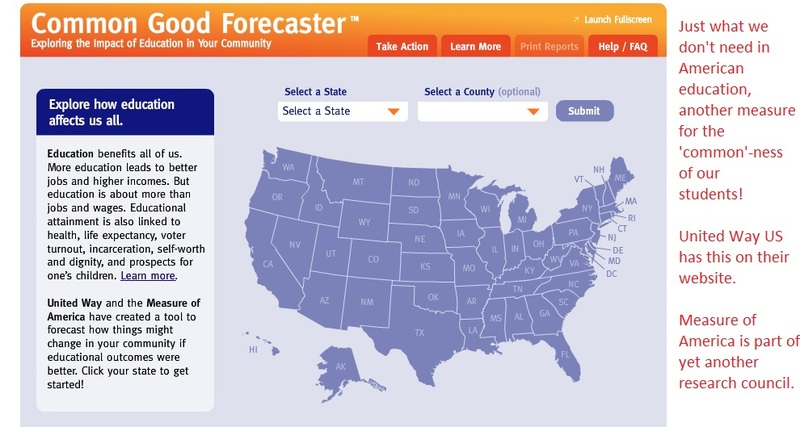 As you know, using what I have found can help you look in your state for the same type of movements. Below, you can find some of the CCR champs/chumps. The goal: “North Carolina ’s Career Readiness Certification (CRC) is designed to meet the needs of both employers and job seekers in this transitioning economy. · For job seekers, the CRC serves as a portable credential that can be more meaningful to employers than a high school degree or a resume citing experience in a different job setting. Is the NC CRC the only group of its kind in NC? No, we need to look at the NC New Schools Rural Education work, too. You can find them at: http://ncnewschools.org/national-rural-education-initiative-to-improve-college-and-career-readiness/ Did you notice the web address included ‘national rural education’? NC is embedding it out in 6 school districts, however, SC, MS, and other states are set to reap a champion ‘bumper crop’ as well. 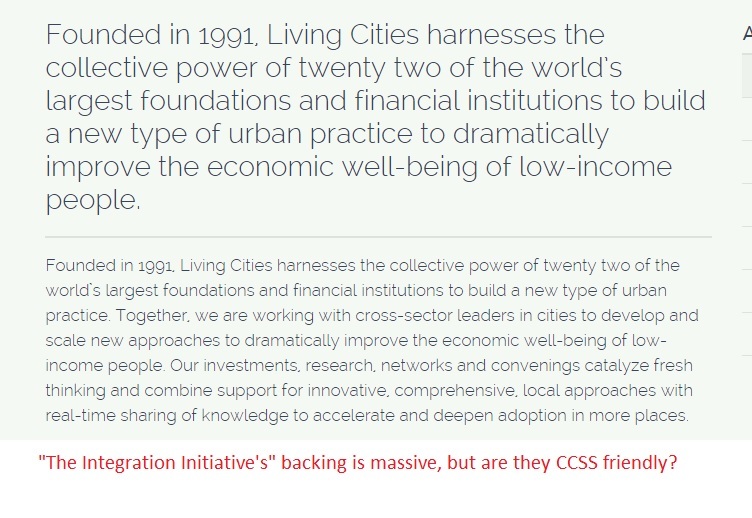 Since the Gates Foundation is a well known member of the CCSS Machine, it won’t be hard to connect the dots there. New Schools are in several cities and states across the nation, so they should be easy to connect to the CCSS Machine as well. See below for the members of the Task Force, among them? Many states and pro CCSS/CRTE groups! So, How Does All This Tie to the HEA (HIgher Education Act)? As I’ve shared in the past about the current HEA and the proposed updates, the bridge between secondary education and post-secondary needs to be streamlined (I’ve written about those bridges before and pointed you to the documented ‘research’ churned out by not only the Gates Foundation, but others as well. If you missed those articles, let me know, I’ll be happy to share them again.) The ways in which post-secondary educational institutions are to be graded and governed in also in the proposed updates. See the Education Commission of the States report: ECSBlueprint ( the Commission is a nation wide one, not a NC specific one) The report shares how the P-20W data (pre-school to grad school or Workforce) plays into the situation as well. P-20w is in the HEA, too! 3) Helping write the re-authorization the HEA are some of the same members of Congress who’ve embedded so much pro CCSS language in the re-authorization combination of the HR5 and the S1177 (Student Success Act; Every Child Achieves Act)! These are all champs to the pro side of CCSS/CTE/CCR, but to the rest of us? Just a bunch of power hungry, sold out to the CCSS Machine chumps! 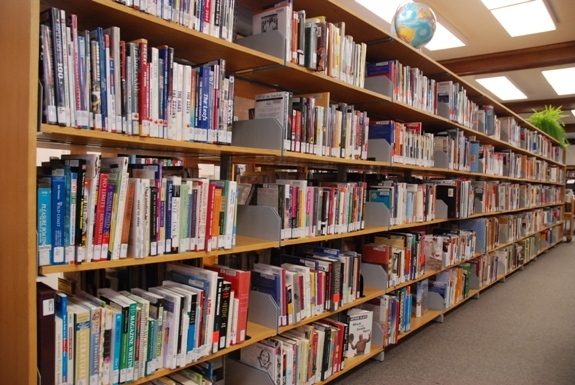 Today’s article uncovers the almost $10 million dollar grant for adult literacy. Would you believe an almost $10 million dollar grant given to the National Research and Development Centers was given back in 2012 and ends in 2017? Would you believe it’s tied to Common Core ELA? Would you believe it’s geared for ADULTS both in the USA and Canada? 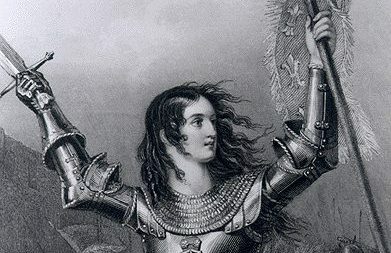 Read on, my Warriors! How much money was awarded? Exactly $9,999,985.00! The institution receiving all that dough? Georgia State University. Here are just two of the ‘facts’ I’ll share, you can read the rest of them on your own. 1) A curriculum is being written for learners to use. 2) A computer program will teach them to read. Okay, so far, we’ve gotten the U.S. Dept. of Education and some of its sub-departments, so we know that’s ONE aspect of CCSS/CTE (Common Core State Standards/Career Technical Education); we’ve seen that AIR’s connected, so that’s a SECOND aspect of alignment. But..is there more?! Oh yes, my anti CCSS Warriors, there most certainly is! Where did I find those featured below? On the website of the almost $10 million grant project! 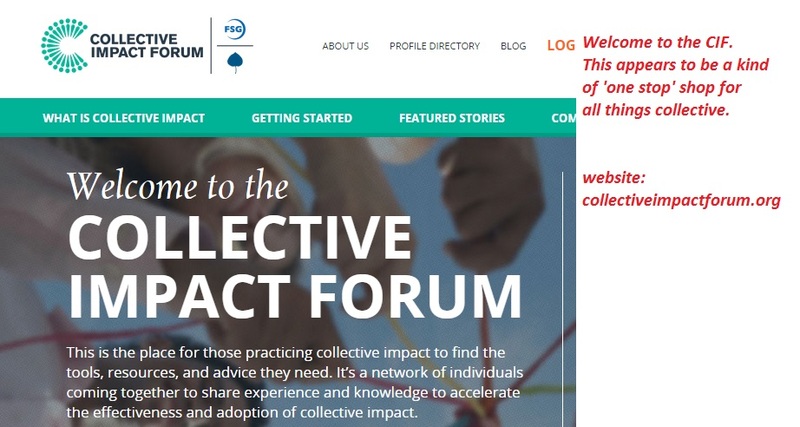 To see how CCSS/CTE bound this group is, be sure to read the portion of the website’s homepage where Carnegie Foundation and the Ford Foundation are given credit for helping create the Council. More CCSS/CTE pro supportive groups also give lots of money to the Council (see: http://www.caalusa.org/funders.html). 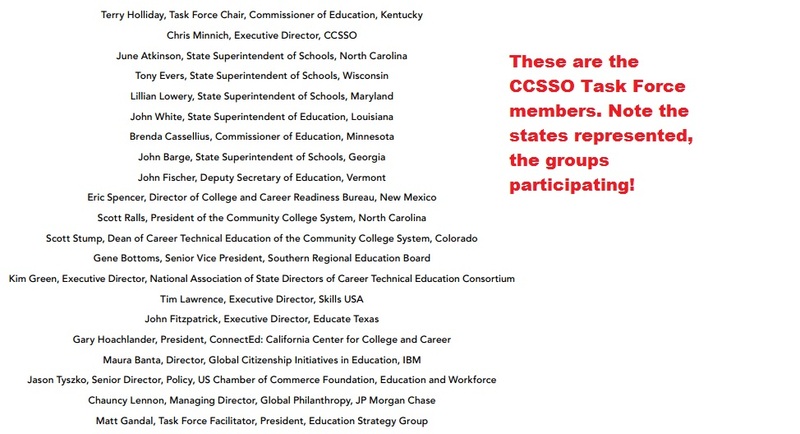 There you’ll see some of the most familiar CCSS funders like Lumina, Verizon, the Joyce Foundation, and many more. “Commission on Adult Basic Education” (COABE), based in Syracuse, NY. When I took this screen shot, the words were changing from “Test Ready, Future Prepared” to “Now Available the College and Career Readiness Standards”. If you look around the website a bit more, you’ll see the USA is divided into regions. “Center for Applied Linguistics” based in Washington, D.C. Founded in 1959 with a Ford Foundation grant, CAL is very supportive of the CCSS/CTE. Are there others groups like the ones above? Yes, there are. I’ll be looking up close at them in a later, not yet written article. While all the information above is certainly very revealing about how in-depth the CCSS/CTE Machine is going beyond K-12, I want to re-direct your attention to one of my very first anti CCSS blog articles where the CCSS Adult Standards were shared. Part two of the look at the recent conference discussing the re-authorization of the Higher Education Act. In today’s post, we pick up where the CCSS/CTE trail left off from yesterday. That is the “Next America” Conference held recently. Sen. Alexander, Ted Mitchell, and the others you see above all spoke. We looked at Mr. Mitchell’s speech yesterday. Today, it is an opportunity to hear what the Senator said. We’ll also look at what the panel had to share as well. Will there by more Common Core/Career and Technical Education speak? Once again, here’s the You Tube video of the conference hosted by “National Journal”, the Gates Foundation, and Lumina. One thing we’ve seen in those pushing the CCSS/CTE legislation, is their pride in the belief that all this reform and alignment is the greatest thing since sliced bread. IF the person is a politician, the pride factor of how they’ve been key to this is doubled. Below are the key times and CCSS/CTE catch phrases from Sen. Alexander. His speech begins with a ‘gloom and doom’ statement about America being 5 million jobs short by 2020 because we won’t have enough properly skilled post-secondary trained graduates. (as stated above, Alexander’s speaking begins at the 1 hour, 23 minute mark). From that point to near 1:25, Alexander condemns K-12 education as well as give you a brief history lesson about post secondary education. Then, three key agenda items to be written into the re-authorized version of the Higher Education Act (HEA). (*Note: when you see this, notice what document he holds up with pride. It’s the ‘blueprint’ for exactly how this 3 top priorities (he’ll go on to tell you the blueprint has 59 changes). If you don’t have this blueprint, you need it. It is full of just how CCSS/CTE friendly the HEA will become. See: Regulations_Task_Force_Report_2015_FINAL Be sure to listen for the other key legislators the Senator keeps naming. We need to look further into their part in all this (at a later time). 1:27-1:32, you’ll hear how those top 3 priorities are now suddenly 5 steps. Be sure to listen for the Medicare funding connection; the filling out the FASFA (which would be re-named) in your students junior year of high school (‘we must get them started even earlier’); how College Board’s opinion is of importance; and how ‘free’ (or ‘nearly free’) colleges can be. Alexander’s speech ends at 1:34. Then, it’s on to the one-on-one talk with one of the hosts. This is the part of the video you need to have a piece of paper and something to write with. 1:38 (and several other times) ‘skin in the game’ reference. This relates to having colleges join in on student debts. 1:44 listen for the ‘ax grinding’ or grudge that Alexander displays toward the U.S. Dept. of Ed and how he now can address it via legislation. As in part one, I shared with you how the Gates Foundation and Lumina were both not only hosts of the Conference, but speakers as well. I encouraged you to look at each of the biographies for these assorted members of the panel. It is at the 1 hour, 50 minutes mark, the balance of those featured in the above picture, gather to speak about all that’s been shared thus far. If you’re looking for indoctrinated talk, you’re in for a treat. The Q/A begins with modern innovations in the classroom. *Having employers become part of the post-secondary accreditation mix so that college is relevant and can respond to businesses. *How more states are participating in performance education based funding and how many more should be participating. 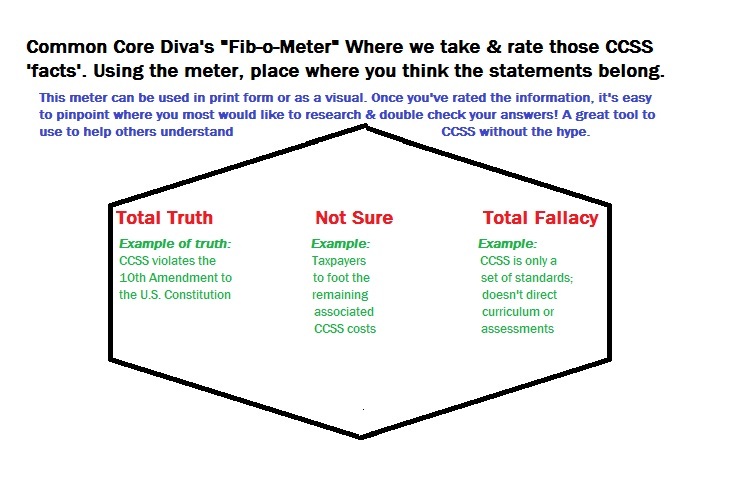 As a follow up to today’s article, be sure to read the “Fib-o-Meter” Friday article coming tomorrow. I’ll connect the dots on how community colleges (so overstressed in this conference as the answer America needs) are so entrenched with CCSS/CTE. One of the featured speakers at yesterday’s conference (sponsored by Lumina and the Gates) was Sen. Alexander. Sen. Alexander has been a huge supporter of aligning education for quite some time, especially where CCSS?CTE are concerned. He’s presently rewriting both the HR5 AND the HEA legislation which will impact (and align) everyone from K-College. Mr. Mitchell, with the U.S. Dept. of Ed has also been at work (quietly) on 5 agenda driven initiatives concerning education. What’s ironic is that while Alexander’s been getting a lot of press, Mitchell has been continuing on in helping the CCSS Machine roll on. Today’s post is Mr. Mitchell’s turn to be featured. 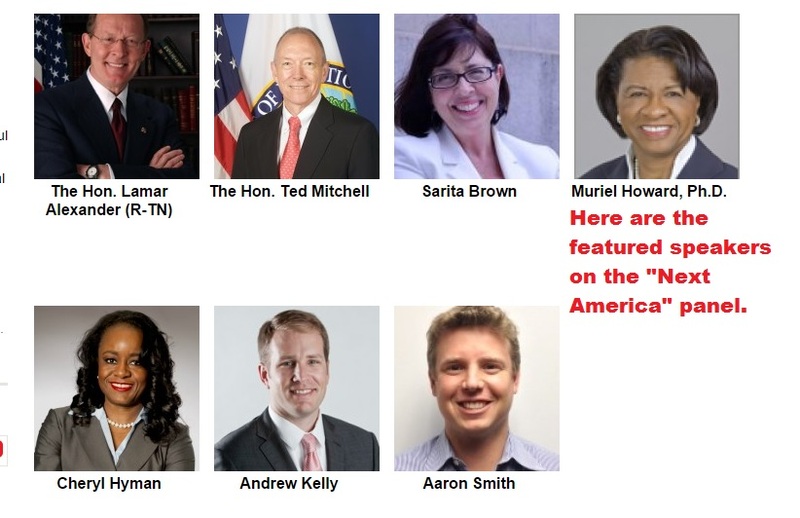 (*Note: we’ll look at Sen. Alexander’s portion of this conference in Thursday’s ‘Tech Thursday’ post) So, let’s find out just what Mr. Mitchell shared with the “Next America” folks. I’ve included the host group’s history for you, as it also needs some anti CCSS warrior attention. First, a bit of history. If you don’t know what publication the “NJ” is, the website for the National Journal, states the following: National Journal is regarded as the most influential publication in Washington, providing more than 3 million influentials in public policy and business with the insights they need to make government work. Fiercely honest and scrupulously non-partisan, National Journal has a four-decade history of serving leaders in Washington—and around the country—with trustworthy, in-depth analysis on legislation, politics, and the structural trends shaping America. As far as the event held on the 9th of June, NJ proudly announced it was underwriting the conference. (To see more about all the NJ hosted events, be sure to read the bottom left corner of the link to access the conference video. On the website page with this picture you can get a brief biography and all the contact information you could want. I urge you to look at each one’s biography. “To spur education, economic growth, and social prosperity, Mitchell is charged with planning and policy responsibilities to implement President Obama’s goal for the U.S. to have “the best educated, most competitive workforce in the world” as measured by the proportion of college graduates by the year 2020. Mitchell and his team are keenly focused on implementing President Obama’s American Graduation Initiative to improve college access, affordability, quality, and completion. Mitchell is the former CEO of the NewSchools Venture Fund and served as the president of the California State Board of Education. Can you see the potential for Common Core and Career Technical Education here? I can! During Mr. Mitchell’s time, he extols the virtues of the ESEA and the HEA; how they are forever joined and how each is a ‘moral imperative’ (see the 27:40 mark). From this point until the 28:50 mark, you’ll hear about the national credentials in education. Following this are the buzzwords ‘pipeline’, ‘equity’, ‘opportunity’. Then at the 29: 04 mark, you’ll hear the buzzword ‘rigorous’ immediately followed by ‘college and career ready’. What could be better, you ask? How about ‘modernizing education via standards and assessments’?Then by the 29:25 time mark, Mr. Mitchell has successfully told the audience that all his previous claims can be ‘deepened by the HEA’. From this point on you’ll hear some of the following catch phrases or programs. I urge you to take the time to listen to Mitchell’s speech. It’s followed by a one-on-one interview that is also filled with rhetoric for education reform we’ve become used to. Near the 34:00 mark, listen for the federal role in technology; 36:00 mark, how Congress is needed to back up the U.S. Dept. of Ed’s efforts completed thus far; ’21st Century Learners’; how much better America is since the Feds took over student loans; how Congress needs to empower the U.S. Dept. of Ed even more; making college as a ‘universal learning’ opportunity just like high schools have become; ‘student outcomes’ or ‘outcome based schools’; ‘evidence based interventions’ and finally ‘skills vs. developmental learning’. Tomorrow, we get to know what CCSS/CTE plans Sen. Alexander shared during this all important conference. Oh, as by the way the Lumina and Gates Foundation not only helped host this event, they weighed in on WHY the HEA needs to be re-authorized as well. 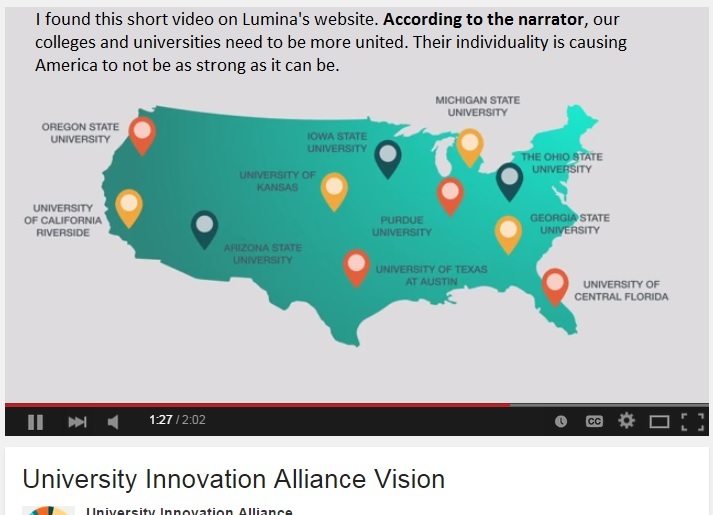 Gates’ guy spoke at the 1 hour, 8 minute mark; Lumina’s president spoke at the 1 hour, 14 minute mark. Normally on Thursdays, I treat you to an article about Common Core in post secondary education. Today, however, I’ve got a special article. Collaborative for Student Success has just released a new infograph about Common Core and our U.S. Military students. What you don’t see below is the staggering number of students set to be in the direct line of fire for receiving CCSS in military schools. Eighty-two thousand (82,000). A document I found on the State Dept.’s website caused me to pose a question. 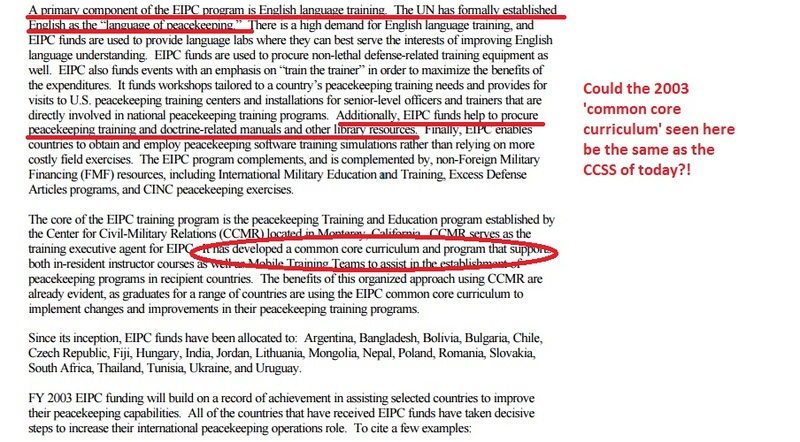 Could the ‘common core curriculum and programs’ developed for the military training be the same as the CCSS of today? I’ve provided a screen shot where you’ll be able to see how some funding was being used. While I’ve not been able to actually see the curriculum, it does leave a question for us. While the above may or may not be THE CCSS, it should concern us. Why? 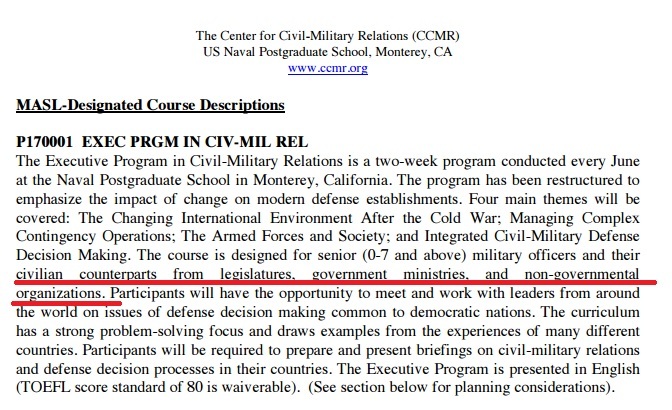 If you look at some of the courses taught in the Civilian Military Naval Post Grad School, you’ll see that the United Nations plays a huge role in it; you’ll see that legislators are involved in some of the classes as well. How do I know this? As an example, take a look at the Naval Post Grad School. Knowing that the UN is behind CCSS and has recently (as in yesterday) been pushing for more CCSS globally, we should be very concerned! We should be finding out all we can!! Read the statement from the head of U.S. Army in full support of CCSS. Hasn’t anyone told him as a defender of the U.S. Constitution, support for the Core is treason? Who is in the Collaborative? So much for objective facts about CCSS! http://www.defense.gov/news/newsarticle.aspx?id=117695 Keep in mind the Defense’s job is national security. Our public trust is that the men and women providing that security are a) honoring the oath they are sworn to take, b) upholding the American values our Founding Fathers based the U.S. Constitution, and c) that the protection provided is not driven by substandard education! 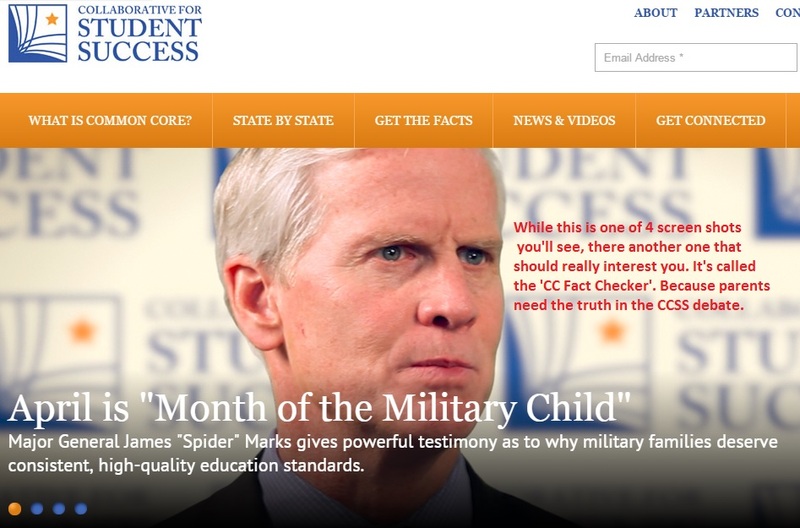 To better visualize just how damning CCSS in our military is, visit the DofD’s website link below. Just look at all the areas of access the DofD has over our nation. Do you really want a CCSS aligned military? Especially given what objective, fact-based evidence, we the people had uncovered?? 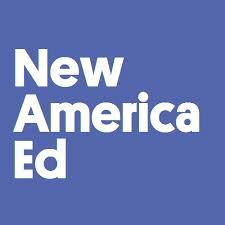 If you don’t New America Ed Central, you need to! Do you see how many of the above listed funders are known Common Core Standards backers?! 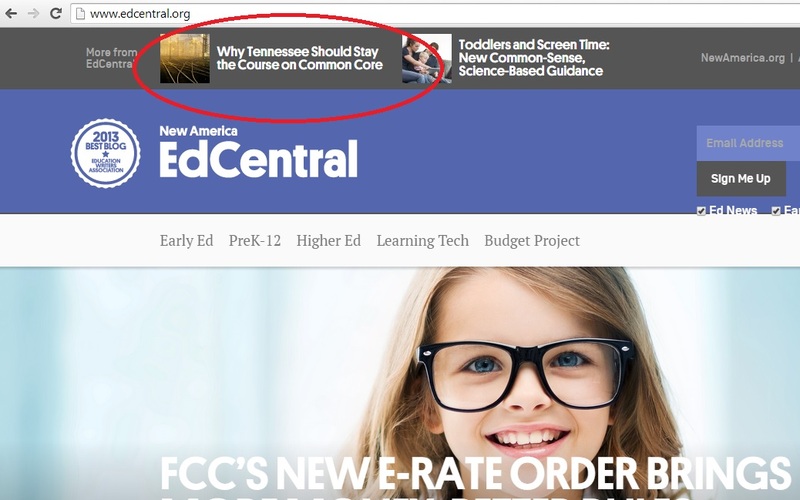 On the webpage for ‘Higher Education’, you’ll see a shameless plug for the recent ‘free community college’ push. See: http://www.edcentral.org/highered/ Now, in case you missed it, I wrote recently how Common Core Standards are already in community colleges across the nation. There have been other anti CCSS warriors spout off about the plan as well. While all the above is enough to make the anti CCSS warrior scream, you’ll need to save it until you see this. A FEDERAL education budget project. Again, look above to the names of the groups backing the New American Foundation’s Project, “New Ed”!! Second on the list of Advisors for the Federal Education Budget Project is Linda Darling-Hammond!! Excuse me, does anyone need a reminder of how pro CCSS she is?! I sure hope you see the irony that all these pro CCSS folks are backing federal education money, when ‘federal’ should have no business or portion of ‘education’! As far as the ‘high pay’?? That comes IF you follow their aligned early ed to high ed program via a CCSS education, I guess. At least that’s the sales pitch.